As from July 26th 2008 the procedures set forth by the European Regulation (EC n. 1107/2006) relating to assistance to Passengers with Reduced Mobility (PRM) are in force at Palermo Airport; this regulation has been implemented on an Italian National level by ENAC (Italian National Aviation Authority) Circular ENAC GEN 02A. Passengers must make special requests for assistance to their own Airline (either personally or via their travel agency) upon booking, or at the very latest 48 hours before the scheduled flight time. The Airline will then arrange to have the assistance request forwarded to the Airport. This service is offered free of charges to all the passengers not capable of taking the stairs or walking long distances, to those passengers requiring a wheelchair or a stretcher, to the passengers with visual or hearing disabilities (following to a specific request) and to those with mental disabilities. 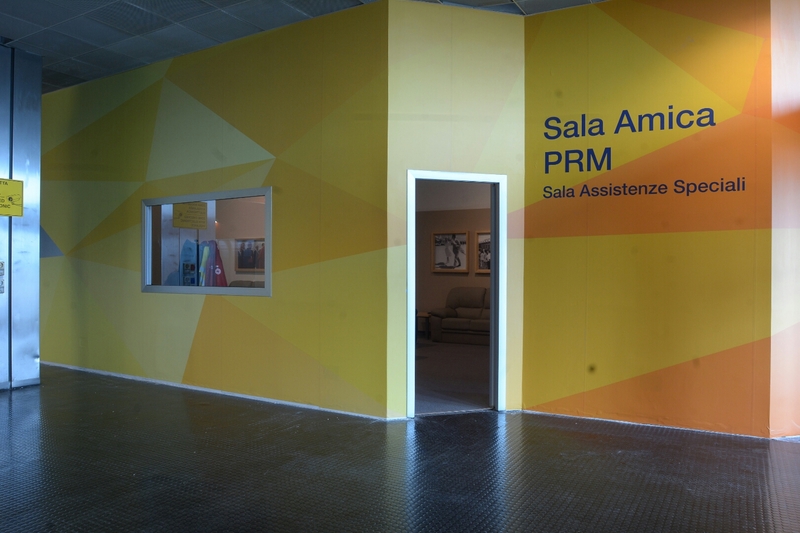 Once they arrive at the airport, the PRM passengers can make their way directly to the Special Assistance lounge on the first floor of the air terminal which is dedicated to special assistance. Alternatively, they can ask to be accompanied to the Special Assistance lounge by making the staff aware of their presence from one of the call points/intercom stations situated outside the air terminal near the entrance of the Special Assistance lounge and in the parking area. For any requests to be accompanied to the Special Assistance lounge, any departing PRMs may make use of a set-down parking space near the call points/intercom stations, but only to get out of the vehicle and unload their luggage; this set-down space may only be used if someone is inside the vehicle at all times. An adequate number of designated parking lots (marked with an H), served by a call points/intercom stations with the Special Assistance lounge is available for passengers with disabilities (if holding a special disabled parking permit). Any notifications of bad service and/or complaints can be addressed to Ges.a.p. S.p.a. – Air Terminal concourse – “Falcone Borsellino” Airport – post code 90045 Cinisi (Palermo) Italy, either by post, by fax to number +39 091 7020720, on the web by clicking here or by filling in one of the pre-addressed cards available in the special complaint boxes on the airport premises. If you require any further information, you can call the toll-free number 800 541880 or go directly to the Airport Info Desk situated inside the Departure hall of the terminal. The Special Assistance Lounge is equipped with free wi-fi (ask the staff for the password).